I blog the more unusual and aesthetically pleasing aircraft movements in and out of Okęcie. Generally, air traffic above our heads consists of, as Eddie says, 'vanilla planes', ie the run-of-the-mill Airbus A320s and Boeing 737s that make up the bulk of commercial aviation world wide. ATR42s and '72s and BAe/Avro RJs are common too. The occasional military flight into Okęcie is worth watching out for (a pair of F-16s, a Hercules, a C-17 Globemaster, old Soviet-era transports). When skies are clear over Warsaw (as they've been for most of this month), you can look further up - to 38,000ft, where planes that very rarely make an appearance on Okęcie's runways can be seen. The Internet is wonderful for giving access to all kinds of interesting information. Lately, I've discovered a page with real-time air traffic radars for Warsaw and surrounding area and north western Poland. Most (not all) air traffic is shown - living on the flightpath, I'm aware of movements in and out that are not displayed on the Warsaw radar (mostly 'vanilla planes' of little interest to spotters). Each plane has it airline, flight number, registration number, airspeed and heading shown. 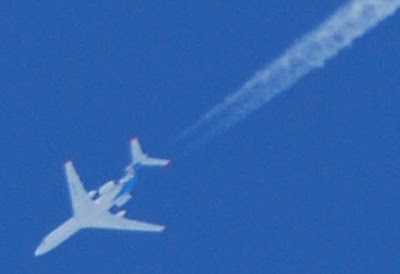 From my window I can see, for example, a vapour trail at well over 30,000ft heading south. From the radar map, I learn that this is a Boeing 777, N701DN, Delta Airlines Flight DAL8, en route from Houston, Texas, to Dubai. But is this of interest to anyone? Seeing a Boeing 777 or Airbus A330 in Warsaw (a rare treat for spotters) leaves most people cold. One twin-engined jetliner looks just like any other, surely? I've mentioned the extremespotting.com website before, set up by some guys in south-east Poland where intercontinental air routes intersect. They have ultra-powerful lenses and capture some stunning images of aircraft in flight at cruising altitudes. Don't worry about it in Poland (the land of the free). In the UK, you'd now have lots of explaining to do to the transport police. Thirty years ago, I was stopped by milicja in Olsztyn station for photographing steam engines there. And in the late 1970s, there'd have been no problem taking photos of any UK transport installation. in Poland it's only limited to scowling at me, there's a kind transport police in Poland - "służba ochrony kolei", but they wouldn't pick on me capturing the trains. But I wanted to point that indeed people are still slightly intolerant and treat somebody with unusual interests as weird, where as it passion like any other - collecting stamps or postcards and surely doesn't bear evidence of narrow mind. A 'zakaz fotografowania' board sits proudly in my collection of old PRL-era signs!